of the face of Christ." I AM glad that The Churchman's Association of New York is publishing this little book which expresses, in his own words, Bishop Lloyd's unfailing spirit of faith, and hope, and love. 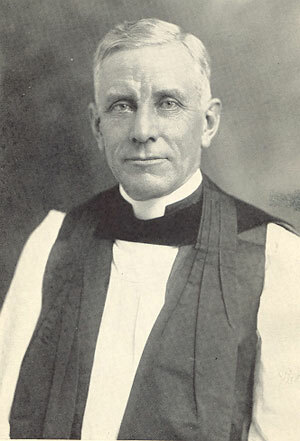 Bishop Lloyd's great characteristics were his sincerity and simplicity, his wide sympathy, his kindly humor, his considerateness and charity towards people of every sort; and all those qualities were founded upon, and grew naturally out of, his faith in the Lord Jesus Christ and his devotion to the Church which he was called to serve as Priest and Bishop. It was his faith in Christ and his true human sympathy which drew people to him; and those who loved him, as all did who knew him, will hear him still speaking in these pages. Try making it your business to wash the slate off clean every night before you go to sleep, on the basis that what He gave us to do is all included in the day we are living in. On this ground we owe it to the work we have to do absolutely to refuse to think about anything that is gone, just as we are not to permit ourselves to be anxious about anything that has not yet happened. The reason for this is that we need all the strength and courage and quietness that He gives us for the use of the day we are living in. Try this. You will know you have been successful when there is a song inside you, and you will know that somehow it went wrong if it looks like a cloud is rising. The real things of life cannot be put into words. The older I grow the more supremely valuable comes to be the ability to know His companionship. Once this becomes practicable, it seems to me that He Himself will do anything that needs to be done. As to how He accomplishes that I think depends on the temperament of the person with whom He is dealing. He made you demonstrative and easy of speech. He made me reticent and (sometimes) hopelessly silent. I think He knows us both, and it is a constant source of amazement to me that He is willing to make use of us. I wish I could make you believe that the children do not belong to you, and that all you have to do with them is to walk straight before them. Himself will develop them, using the means that He sees fit. My observation is that oftentimes the means He uses are very alarming. I can recall as a very small child the amazement with which I would find wrangling in a house where I happened to be. I knew of nothing in my home like it. I was young enough to know that it was different without being able to explain the cause. Looking back there are certain things I wish I had known when I began. One is that school and college are in no wise different from learning how to use mechanic's tools. The more carefully we can acquire the use of these, the better mechanics we shall be. All school and college does is to teach you how to use the muscles that the mind works with. If I could have known when I began the inestimable value of accurate knowledge it would have saved me time that it appalls me to think about and would have made me more efficient. I wish that you would not worry yourself about the things that men believe in connection with God and our relation to Him. Let the Eternal Father and the revelation of Himself in the person of our Lord be as axioms. We cannot prove them, but if a man does not know these two things it seems to me it is not a question of his ability or his fidelity, but a question of his imagination. It is like being able to see things only superficially without being able to appreciate their relation to other things. Forget that and let your thinking be on the basis that these things are true: that God controls and that all that is to be known about a man in his relation to spirit or matter is showed in the person of our Lord. I want to write down so that you will keep it--some day you will know I am right--the recommendation that you study to save you from cheapening yourself, or the work that you will do as a man, by being deceived into thinking that you are the source of it. A man cannot know what his power is until the One Who gave it to him has showed him how to use it. Nor can a man value the gifts with which God has enriched him until God shows him how to use them. So be content to work on the theory that the God Who made you expects you to work by the model He set you, which is His own perfectness. If you will do this you will know from the start that if you are going to win out you must have help. Nothing mortal can be perfect. Attaining the perfectness that is your model depends on the Power that was bestowed; nor can it be attained while a man is in the flesh. A man's measure is in the fact that nothing can move him from the conviction that when he has been able to do anything, it will be after he has spent his life trying to be right. Something happened the other day--I have forgotten what it was--that made me wonder whether my grandsons read their Bibles. If this is not the case, correct it now. I know how easy it is for people to lay aside the Bible because they associate the Bible with religion. As a matter of fact, what old Mr. Reverdy Johnson said to me when I was ten years old is perfectly true. He was eighty years old and more, and blind, and had worked with my father at the profession of the law all the time my father practiced. I went to pay my respects to the old gentleman, and he spoke of the fact that he understood I was to follow my father in his profession. I said, "Of course." Then he reached out until he got his hand on two books that he put into my hand and said, "Boy, if you are going to be a lawyer it is necessary for you to know these two books because they are the only two books that will ever tell you the truth about human nature." One was the Bible and the other was Shakespeare. I never forgot it, and the older I grow the more I am persuaded that the man with a really broad outlook on life is the man who knows his Bible. Your mother told me that this is your birthday. I want to tell you how good it is for me to think that you have got through eighteen years and are still going straight and going strong. I like to think about it the more because I know that by this time you have about made up your mind as to what kind of person you want to be, and what kind of things you plan to go after; and I want you to know the satisfaction I have in believing that you want to go in the way that will make men respect you and will want to do things that are worth while. Naturally on your birthday you will think of your confirmation. I want to call your attention to the fact that this is your constant reminder that the God who made us is our Father and is on our side, not merely to back you in what you do, but to show you how. Keep this in mind and you will always have the comfortable feeling that you are not by yourself. Then take things in both hands and go after what you want, provided first you know you can ask God's blessing on it. Don't be afraid, and don't measure yourself by anybody else. Know that you are the man who has got it to do and that you can do it if you will not be afraid, because God is on your side. God gave you a beautiful temper; cultivate it. Never go back on [yourself] and you will find that our Lord is on your side, no matter how hard the fight is. God bless you! You know I am persuaded that no man has ever lived except our Lord himself who realized what the power of a man is, but I can almost say that I am equally certain that there is no man who knows that the Eternal is his pattern, and spends his life trying with God's help to use what comes to him instead of being driven by it, but realizes as he goes that his power is limited only by his own courage. One thing I should like to suggest. You say, "I cannot decide whether I would rather be a fairly successful small-town lawyer," etc. With all due deference to the superior wisdom of your generation, I believe you have put the cart before the horse. I do not believe anybody has a right to talk about what he would rather do. His job is to find out what he has got to do, and to get busy getting himself ready for it. A Christian man is on the earth to be used by his Master, and whatever a Christian man does must be determined by his most careful judgment as to how he can best express himself. No matter how cold your feet are, never again put into words the suggestion that you cannot do what you undertook. You know you can, and you know you are no coward, and you know you have brains and you know you pray to God. What can lick a man who has these things? Thank you, my son, for yours this morning. Your mother told me that you were going to be confirmed, and of course it gave me great satisfaction to hear it. I should like it if you could think of your confirmation as the beginning of a partnership between you and our Lord, in which your part would be to do what you can to help Him teach people how good a thing it is to love their heavenly Father. But apart from this, I should like you to think of your confirmation as a token which our Lord Himself bestows upon you, to keep you in mind all the time that whenever you have anything to do, He is there to help you; that if you do not understand things, He is there to show you; and that if you get lonesome or in trouble, He is always there to stand by you as your friend. Then when you come to make your communion you will naturally think of it as meeting and speaking to Him, so that you can have a chance to tell Him what has been happening and to ask Him why things went wrong. I am glad you are doing it. If you will abide by your side of the contract, you will find it makes you. free; that is to say you will never be thinking about what to think, or depending on somebody else to show you how to do it. God bless you! You are glad to be back just for the personal satisfaction it gives you. To me it did not make a bit of difference whether you went back or not, but I knew that if you did not go back you could not help feeling it was a count against you, and every time a man is compelled to do anything he cannot resist a feeling of having been beat. Especially on a young man this unconsciously has influence, making him feel uncertain when he faces a thing that has to be done. I want you to know that you can do it. I have not the least question about it. Men are differently constituted. To some men examinations are like answering riddles. It is easy for them. For other men it is hopeless to try to answer a riddle, but this has nothing to do with a man's intelligence or capacity to accomplish what he goes after. I speak feelingly because I am like that myself. I never answered a riddle in my life, and the examinations I have stood I never knew how I got by. If I had been measured by that I should have been in the scrapheap when I was younger than you are. It is the high privilege of every human to form the habit of thinking about our Lord as his personal friend, so that it will become more and more a habit to depend on Him, not only to protect us and show us the way to go in, but to teach us how to do things. I think the relation after a while becomes entirely personal, so that you will go to Him and talk with Him with the same frankness and confidence that you feel to your father, expecting to be definitely helped and showed how to do it. It is a question of personal affection after all. While this is for the present for you a theory, it will grow of itself. Don't try to make it grow. Most of all do your best to keep from being artificial in any sense. Try to avoid doing things because you must. Do things because He says that is the right way to do it and because you want to be like Him. If you can catch what I am saying it will relieve your mind of all those strange impressions that we have got to do something different, or be something different from what God made us. The highest expression of Christian living, and the surest witness that God's Spirit moves upon us is that we are simple and natural and just as God made us, having eliminated what we know to be ugly. I have wondered how things were going with you. I am glad you are not by yourself. . . . Self-control is largely exhibited in never getting in a hurry, and this is useful because if you once get in a hurry, you cannot use your mind. This shows the wisdom of keeping everything that happens to you on the outside, so that you can observe it. You have an impulse to self-depreciation. I want you to know that this is sacrilegious. The loving Father made you and gave you particular gifts. For you to fail to reverence these because your disposition is to give other people the right of way is wrong. Never compare yourself with anybody except the Eternal. Recognize that other people have gifts, and thank God on their behalf. But always keep in mind that your job is to develop yourself and to follow your own best judgment. You have every reason to know that you have good gifts. Everybody likes you. You made good at school. The best exhibit of right living came to you when the school chose you for May Queen. None of these things is occasion for you to inflate yourself; they were given to you--you did not do it. But they are token that you have the right thing in you, and when you feel disposed to depreciate yourself, remember the tokens you received of appreciation. That is what these are for. I want you to go into the school neither boasting nor afraid. It is impossible for you to think yourself superior to somebody else. I know your self-respect will always keep you from that kind of thing. But what you are in danger of is to go there and think everybody has everything that you have not. You are going there not to receive something, but to make your contribution. I wish I could sit down by you and tell you not to talk about "religion" at all. Religion is the exercise that you require of yourself in order to learn how to live. The joy of living is in knowing that our Lord has changed human relations and that we bear the same relation to things physical that our Father bears. He will show us how to meet these, so that no matter how badly they hurt, they will end in benediction. So don't talk about believing that loving the most people is the best thing to do. Recognize it as the only thing to do. You know if there is anybody you do not love, it is like putting a bit of poison into your system. There is nobody living who is worth such damage to oneself, and nothing that anybody can do is reason for doing a thing that hurts you. You cannot help loving people. Let it be for blessing. You have not got to make every soul your boon companion, but every soul is human and therefore beautiful. Think about the beauty. I have an impression that if we could see only the beautiful things in life, nothing would ever go wrong. Don't make yourself unhappy wondering what the task is to which you ought to give yourself. It seems to me clear that just as the Kingdom of God is within one, so the task set for one is immediately at hand if he has eyes to see it. Take things as they come, and above all profit by the long experience of another. See to it that life is a joy as it passes. Don't mar this by being apprehensive for any cause. I am certain that life is intended to be simple and that the complexities of human experience were intended to be kept on the outside of us and were provided in order that life might be continually interesting, and not to add to its burden. All my life I have been trying to find what for lack of a better word I will call a rational basis for all the religious acts that are required of a Christian man. Any suggestion of an afterthought or supplementary demand seems to me to offend the majesty of the Eternal, and to think that the destiny of a creature who is made in God's image should depend on an accident has always offended me. of man is that God touched his creature and made him able to think God; and the glory of the Incarnation is that the same God who made us showed Himself in the terms of His creature's limitations, in order that that creature might climb up to the place where he was destined to dwell. Sometimes I get the impression that our Lord allows His servants to be sharers of His suffering in proportion to their ability to understand. Is not this the reason why being allowed to suffer is the highest honor that can be accorded to us? I like to think of the birth of our Lord as the crowning act of creation in our physical world. I like to think that when He came the slate was washed clean and everything started off on a new basis; that humans are no longer part of the physical world; that they are grown up to take charge of it and to complete in the world what was in the mind of the Creator when it began. This kind of feeling makes me thrill when I read the words that indicate that our Lord was in it from the beginning, and that all that preceded was preparation for His coming. I like to think of the present as being the dispensation in which God Himself rules; the Kingdom of God is come. And I like to think of the challenge to man being that he accepts share as the controller of that which is preparing for what shall be. This is the reason why I do not love to think of a Christian's resting any argument on what a man thought. I like to think of the normal and natural mental attitude of a man being the recognition of the necessity to go up where Christ is before he can think about anything. Why isn't that better than to guess at things as though there had been no Revelation? Why isn't it better to think of a man's studying to learn how to accept life, and to think of life, and to understand life in the terms of the Revelation that was showed us in the Incarnate One, than studying to defend himself against physical things? I find myself having an increasing desire to help somebody to realize that the Word of God became incarnate first to offer Himself as a sacrifice for the sins of humankind, and then to make people able to live according to the law of their Father's life; after the Christ had given the ability to do this and had provided in Himself the food which would sustain in them the life that came down from heaven--thus making it possible for mortals to overcome in themselves those things which must perish, and attain to His completeness through faith in Him as the revealer of our Father's perfectness. I know that I constantly reiterate this one thing, and I can easily understand how a reporter might fail to catch my meaning. I am taking the trouble to say all this because I would not put the least obstacle in the way of anyone who is trying to be right. Most of all I do desire that everyone should know that what I say is in the last analysis only my best understanding of the truth that He wants all men to receive; so that if what I say offends the other man he may know that after all there is no occasion for offense, but rather sympathy for me that I cannot understand more definitely. The older I grow the more I am persuaded that what the Church was created and sent to do was to proclaim the Incarnation, in order that all men might understand that they were no longer subject to physical conditions, but master of them. Just because the Catholic Faith can only be declared in such a statement as includes no definition--infinite verity cannot be defined. The Revelation is a showing of infinite verity--it comes to be that the Catholic Faith is the acceptance of a fact in God's own act of creation, when the Word of God took our nature upon Him. And that is the Faith. What the Faith means comes through experience. The Church is the teacher and shows its children how to develop a right experience. The measure of success in any man's life is his growing up into the likeness of the Word of God become flesh, just because the law of God's life is the law that is controlling this present time in which He is gathering together His elect. What is the matter with that? Nobody believes it, and I cannot find anything that bears me out, but it seems to me to go without saying. Throw this away if you want to. Don't bother with it--but I have got to say it! What we suffer from is the instinctive disposition of humans to get back to the jungle, and the hope of the future is in the fact that having got back to the jungle they cannot be happy there, but must return to the task of lifting the creation up. It seems to me we see a token of this in so much talk about shortening the day's work; and in the amazing thing that they call technocracy. Two things may be taken for granted; The first is that if the Old Testament means no more than it seems to mean to you, it would have been superseded long ago with the rest of the old documents. If Christianity were no more than it seems to be in your article, then it would have been outgrown. What I want you to do,--not for your own sake but for other people's sake and just because as I said just now you seem to be a man of excellent gifts--is to lay down the working theory propounded by the Christ by the side of the theory that your statement would indicate, and ask yourself which is likely to survive. The older I grow the more I wish I had power to make people believe that the only thing that He made us need to do is to sit down at His feet and let Him tell us about it. The conditions of our world would drop into place as a timeclock. Unless you are weary, may I propound another theory? You know for years I have been telling you that I was persuaded the word "religion" did more to hide our Lord and His incarnation from men who were trying to see Him than all the ungodliness and atheism. I am sure I am right. Gradually it has been borne in upon me that the fundamental difficulty in this is that we talk about the Scriptures as religious books, and as books that reveal religion; so putting them in the same category as all the other speculations of the sages and the men whose spirits God has illumined. I have come to the place where I am persuaded that the scriptures of neither the Old nor the New Testament ought to be regarded as religious. They are records of the facts concerning the evolution of human nature. Think about this, and think of all the Old Testament being for the purpose of making clear the process by which humans grew up into knowing why the first verse of Genesis is true. While I do not believe that any of us has a technical right to the term "Catholic" as belonging to ourselves, your statement seems to me to be very properly described by this term. Perhaps what gave me the most satisfaction was that evidently the man who wrote it was an American. I wish all the men of your group could accept what you say con amore. They have it in their hands to render a great service not only to the Church but to the American people. You know just as well as I do that there is but one Church. Our Lord Himself ordained it. That Church is the living witness to the Incarnation. He Himself said it is going to be here bearing witness to the Incarnation until He comes to take charge of things Himself. Meantime He never told anybody he had to think in the terms of men's definitions. He never told us that everybody had to do the same thing. But He did say that the reason He established His Church was that by the very manifestation of it people would know that He is the Lord. That is the reason why I am jealous when you put the emphasis on an accident. Nothing is so apt to make on forget one's obligation to be kind as conscious security from the dangers or suffering of which one is spectator. So it is not to be wondered at that the Church also, being mortal, should in the security of her prerogative seem to lose sight of that which she would be quick to claim as her dearest privilege--the right to make her own the suffering of the most obscure, and to shed tears for the sin of the least one. Long service makes it easy for the servant to lose sight of the fact that he is a servant, and to assume the attitude of master and dispenser; so it is not to be wondered at if the Church has at times acted as though she might in her own power pass judgment on human life; thus finding not excuse but necessity for hardness and cruelty. Without the circuit riders I do not see how the people in America could have been saved from paganism. All the other dear friends who have helped to build up the religious life of the American people have been able to do it because they always had something to push against. You and I believe that what men call the Protestant Episcopal Church stands for what from the beginning the Church has borne witness to. Why not call men's attention to this? Why spend our time protesting against what somebody says or does that we do not believe the Church would stand for, and why waste our energy advertising the things that we believe militate against the Church's usefulness? Every man has a right to think for himself. What you and I are for is to call people's attention to the fact that if they want to know what is safe to believe concerning things that nobody can know, they should follow what the Church has taught through the ages. Leave every man to express this in his own terms. You have no more quarrel with the Roman Church than you have with the Baptists, and you know they both minister to the building up of God's Kingdom. But why should we quarrel with either because they do not know the best way? You and I know the best way--or think we do. Why not be content to proclaim it? The time has passed when there was any reason for disputation concerning what the Catholic Church teaches. On this ground the Church has allowed the interpretation of the Faith as it is presented at St._'s, just because there is nothing of the Faith in the manner of interpreting it and men are differently constituted. The Church has seen fit to allow it when men have brought back that which before what we call the Reformation was the uniform expression of the Faith. When the Church separated itself from the Church of Rome because of the decree of the Council of Trent, certain things were omitted because they had been identified with superstitions. But the Church today seems to consider that the need for such discrimination has passed, and therefore it allows men to use such means of interpretation as in the past have found place in the Church, resting in the confidence that what is artificial will finally be outgrown. When the time came that those who had companied with our Lord had passed, we find that the creed had been made more explicit in its terms, but this was always for the purpose of keeping clear "the Apostles' doctrine and fellowship." When at last the Church emerged from the period in which the tradition of the Apostles had been the controlling influence, we find the Church definitely organized for work, with the Bishop's office as the center around which all was built up. There had never been any question as to what the Faith was. Everywhere the Bishop's office was taken for granted as demonstration of the Church's unity in the Faith. This can be accounted for most simply on the theory that the Church had been led to create the office of Bishop in order that the Body might be articulate and so made able to bear witness to that which the Apostles had seen and heard. This theory seems to be borne out by the fact that everywhere the same emphasis was put on the significance of the office of a Bishop. . . .
As to the Church's order, I am more and more persuaded that the Bishop's office is the living witness to the resurrection of our Lord and to the truth of the Sacraments which He ordained. As men speak, I do not see by what other means the living witness which He commanded His Church to bear could have been maintained. Let us begin with the fact upon which all agree; that the present distress in the world is due first of all to the unrepented sin of the Church in disregarding the Mind of the Church's Head. Time has proved that the divisions of the Church have resulted in the establishment of groups which are practically antagonistic. The consequence is that the Church cannot bear witness to the Revelation which He showed in His incarnation just because the world which He redeemed is confused by jangling voices which are trying to prove their own contention. This will continue until the Church learns that it is living in a state of sin, and repentance will have taught us all to substitute humility for pride. The question is, how can we hope for the accomplishment of this which we all know must be before the kingdoms of this world become the kingdoms of our God and of His Christ? I am persuaded that . . . Christian men must learn to live in such fellowship that they will lose the disposition to prove themselves right and be consumed with a desire to find out why they disagree, so that they may be at one. As I understand it, the Word of God became incarnate for the purpose of making clear to human nature, so far as mortals may apprehend this, the truth about the eternal God: to show the human what is the truth about human relations to the Eternal and to the physical universe; to show man how a human lives who knows the truth; to make men able to be and to do what He showed; to give man power to do the work of a man. In His showing the truth we have what the theologians call the Atonement. In making men able to live the truth we have what is meant by the redemption and the forgiveness of sins. Himself said that the Kingdom of God has come. It seems to me that this means because of the Revelation. After He had finished His work He went away, leaving the Revelation which He had showed to the Body which He had created in His own likeness, and endowed with His power, and inspired with His Spirit, for the express purpose of bearing witness before all mankind to the Revelation which He had showed in His own Person. In the nature of the case the process by which human nature would grow up into His likeness would be age-long. Meantime that Body was to be the living witness that the Revelation was showed, and what was showed in the Revelation. How could this be possible except the Body was articulate? And how can we think of the Body being articulate except in the Orders of the Church? For instance, on Easter Day every minister of the Gospel will proclaim that Christ is risen again from the dead. How do we know it except as the living witness He ordained testifies to it--that is the Orders which have come down through the ages, standing for the same thing? Next Sunday morning we shall all administer the Blessed Sacrament. How do we know that it is the Sacrament which He ordained, and that the Sacrament stands for what He declared, except in the Order which administers that Sacrament? My conviction [that Christ by His Spirit taught the Church to constitute the Orders of the ministry] is only the more fixed as we observe that the Church's order grew as everything that is natural grows. It did not begin fixed and established as though it were a mechanical performance. It grew up in the Church until finally the whole Church was administered by the Orders of the ministry which were finally accepted, and ever since this has been the basis on which we rested our case. Even the Bible itself is known and declared to be the Word of God because it has been safeguarded by the Church, just as the truth about the Resurrection and the Lord's Supper has been preserved. Please be careful to note that in what I have said there is included no single thought concerning the saving of a man's soul. The individual is saved by his faith in Jesus, that He is the Christ; just as civilization, when it comes, will rest upon the same faith. The conference at Lausanne to me was interesting chiefly in the fact that every company of Christians represented there declared their fidelity to the Catholic Faith, showing that fundamentally the Church is one. The disagreement is caused by definitions. No definition can be a matter of faith. Suppose that we could get rid of the heresy that the Church is here to save men's souls, and emphasize again the truth that the Church is here to help men whose souls are saved to live according to their birthright, don't you think it would be easier for men to get together to compare their definitions as to what the articles of faith mean and, through learning why they disagree, arrive at a statement to which all can subscribe? I believe that the greatest heresy that hinders the Church today is the belief that it is an organization to save men's souls from perdition. The Church never taught this, and I do not believe that individuals could consciously make such an assertion. But there is fixed too definitely in the minds of the unthinking that the only use they have for the Church and for the faith of a Christian is to serve them as insurance against the suffering which they know they deserve. Don't you quote me! I am in the bad books of many of my brethren and you must save my face. My difficulty is in the fact that all these statements seem to approach the thought of the Church from the point of view of an organization that men have created for the accomplishment of a purpose. This for me causes confusion which appears to me to make even a correct statement convey a wrong impression. The more I think about it the more I am persuaded that the Church as the Christ created it can only be described as a body which grows by the accretion of individuals who identify themselves with the Christ. So it seems to me the only definition I know of the Church that would serve is the whole body of faithful people. The names by which they identify themselves are an accident. A large factor in the difficulty of the reunion of Christendom is in what we understand by the word "authority." One more thing: I believe the whole Church must come to realize that it was sent here to declare what God in Christ Jesus has done for human nature and not for the purpose of saving men's souls. It does not seem to me a matter for argument that when Christendom presents a united front it must be on the basis of the Catholic tradition. All men must agree that what has always and everywhere been believed is the only foundation on which they can build, while they reserve the right which a man must claim of interpreting as he understands. Yet I suppose if there is any one thing that the Christian community in America, speaking generally, knows nothing about, nor cares anything for, it is the Catholic tradition. And what troubles me most of all is that this Church seems consistently to teach that the Catholic tradition is of no significance. It seems to encourage people to think that private opinion is the final ground of decision. When I see men who have given themselves without reserve to the priest's office fighting one another because of the manner of administration, or on account of the terms they use or the vestments they wear, it distresses me the more because such argumentation only diverts their attention from essential things. If it were a matter of course that so long as the Book of Common Prayer is the norm men would in these things be guided by their own and the congregation's best judgment as to what will best serve the edification of the Church, would it not make for counsel instead of contention? I do not suppose that there is any question that when the Church of England repudiated certain definitions and forbade certain practices it was because the time required it; not because the Church in England had any idea of breaking away from Catholic tradition. What the Church in England decided then time has justified, and for me the decision is as valuable now as then; but many disagree with me. They think the new day demands much that was laid aside then, and have brought back again many of those things which the Church in England saw fit to discard; and nobody would dare to say that these men are not faithful. Why cannot the whole matter be lifted out of the realm of contention, leaving the question of difference of opinion and practice to be settled by experimentation, on the general principle that what is true will survive and what is artificial will be sloughed off? I am perfectly certain you are right when you speak of the lack of influence the Church exerts. For years I have been trying to find an answer to that question. More and more it has been borne in upon me that the reason for the Church's lacking influence is largely due to the fact that unconsciously she is propagating a system of theology and not the Faith. The reason why the Church is in the world today without seeming to have any positive influence on public opinion is just because it has been diverted from the purpose for which it was created and sent, to an association of individuals bent on getting something for themselves. I know that when people have found out that the only way by which they can show their own high thanksgiving for the Gift that has been given them in the revelation of the Word of God, is by devoting themselves to sharing in proclaiming that Revelation, the Church will become an evidently positive force in the building of civilization. Nor do I know any way by which people can do this more surely than by making the offerings they devote to the propagation of the Gospel the definite expression of their high appreciation of the liberty that Christ gave them. It will all blow over; I suppose it is finished now. Of course the newspapers never got it straight, though they had enough truth to go on to float the reports. You make me laugh when you demonstrate that the world is upside down. It is just because it is so completely topsy-turvy that I feel as if the time had come for a change. As men speak, nothing but imbecility could get the country into the condition that it is in, so I conclude it is the Almighty doing it Himself. I know this is not a degenerate people, and yet the performances lately are the perfect demonstration of degeneracy. This is so complete that it seems to me the Almighty Himself is showing people what fools they are. The only thing we can reasonably say we know is that the earth is going to keep on revolving; which means that when He has shaken the people hard enough He will give them another chance. Some newspaper charged the Church with being colorless and insisting on remaining on the fence. My comment was born of the knowledge that I have that if one refuses to become an advocate he is bound to be charged with having no opinion, and this is just as true for the Church as it is for the individual. But I glory in the fact that hitherto the Church has had the courage to stand for the truth for which it was sent to bear witness and has refused to become an advocate of any opinion with regard to that truth. I have your circular inviting me to add my name to the open letter it is proposed to send to the people of Japan. . . . I do not quarrel with what you would like, but to send a letter to a foreign government saying that American citizens take issue with the government that the American people have set up, somehow offends me. By what token can any individual know why the government sees fit to pursue a particular policy? The simple fact that what He said appeals to the highest and best in us does not signify simply because this may be a matter of temperament or development. Other men in other ages and environments have demonstrated the same thing far and away beyond the apprehension of their contemporaries; but coming ages have found this insufficient simply because the experience of men outgrew it. How do we know that this will not be the case again? For instance, how do we know that what we read in the paper this morning is not an advance on what you have been teaching, when men in Moscow declared that dedication to the service of humanity was higher than any conception of any deity? In other words, have we got a safe starting point anywhere except in the absolute, and is there any absolute except in the One who created us? May we expect the mind of the Creator to be perfectly showed in any created thing, however lift-up that creature may be above his fellows? I cannot understand it. Sometimes I think if we could know the reason why He lets us be ground up, we should enjoy so being ground. But He knows what He is doing, and maybe the most useful thing of all is in learning how to be glad of the grinding without knowing why it is done. Certainly He knows about it, and certainly He never lets anything go to waste. But knowing this does not relieve me of my distress at being unable to be of any use to you. He will give you the courage to endure, and you will find that after all if one will stand still, he will see how God has taken care of him. The difficulty is in being able to stand still. I wish I could make you able to know just how to do that, but I cannot. All I can say is--God help you! As a matter of fact, a man is shut up to the facts that confront him, and the only thing we can do is the best we can as the days come one after another. It is good to know that the One we serve is always present with understanding sympathy to show us how to do what He has set us to do. I believe that the most one can do when any condition confronts him is to be sure that he will receive con amore that which circumstances seem to require. My experience leaves the impression that our great difficulty is that it is so easy to conclude that the thing we want to do is the thing that He has set for us to do. Nor do I know how to safeguard this. The farthest I have got is that we shall do the best we can not to make a choice until we know what we have got to do, continually petitioning Him to save us from deceiving ourselves. I have gone on this basis many years. After the event many times I have wondered whether I was successful in having no choice except that which He made for me. But life's experience is convincing witness that He has never been indifferent but has always stood by and converted even a man's folly into means for accomplishing the thing which He had sent him to do. It is good to think about. My opinions seem to be crystallizing into convictions--though for one to talk about having convictions concerning a thing nobody can know anything about is a pretty bold statement. I have come on the days when I am happy in being able to do what I have to do. . . . The nearer one comes to the end of his day's work, the more desirable seems to be the opportunity to tell people, whether they hear or not, what is the way to go in. You have a pleasant anticipation in coming to the end of your day's work and knowing that the only thing to be regretted is that your own limitations have hindered you from availing yourself more profitably of the privilege that was bestowed upon you when you were entrusted with the care of the priest's office. We have nothing to do with what may hit us. It is bad business even to think about it because it keeps one from enjoying the present minute. But all will be well, and I can think of no better satisfaction in a man's life than to know when the end comes that he never squealed. That is what I am hoping for, and you and I will applaud each other. "No! That wasn't the Bishop! He had on the Bishop's clothes, but he wasn't the Bishop. The Bishop would look right at me and he would say, 'God bless you, little man.' "
II-The Bishop's attitude towards children, and impressions received in his own childhood, pp. 8, 9. III-Counsels to adolescents approaching confirmation, pp. 10-17. IV-Pastoral Counsels of encouragement and advice, pp. 18-24.
its organization and the causes of dissention among its members, and factors which make for unity. 1 The Creed, and suffering as a help to understanding, p. 25. 3 The Incarnation and the Jungle, p. 29. Its organization, pp. 37, 38, 42. Its Mission, pp. 27, 33, 38, 41, 42. The Antidote, (The individual is saved by his faith in Jesus, that He is The Christ. ), pp. 42, 46. 5 The Bishop's Office, pp. 37, 38. 6 The Church and the Churches, p. 35. Faults of the Church, pp. 29, 49, 50. Glory of the Church, p. 52. Unity of the Church, pp. 34, 39, 43. Nature of Authority, p. 46. The Root of Dissention, pp. 28, 35, 42, 44, 47, 48. Tolerance, pp. 35, 36. What it is not, pp. 43, 44, 45. What it is, pp. 45, 47. Changing Standards and the need of the Absolute as a final determinant, p. 54. The Scriptures as a test for Philosophical Speculation, p. 30.
but records of the facts concerning the evolution of human nature, p. 31. The Religious Man, pp. 31, 52. A World upside down, p. 51. War and Peace, p. 53. Uses of Adversity, p. 55.